With our integrated GST enabled Invoicing system, you can easily create customized Invoices. Ignore the hassle of managing your invoices your excel sheets, get on board and try us for free. Get Rid of Legacy system of manual invoicing.In 21st century do we all have time to invest time to write money rather than making money? we at purnadata, provides an effective E (Electronic) Invoicing system. How Purna Invoicing Works ? Purna Invoicing system is cloud based. meaning all the data is stored on the remote server, so your cost of hardware reduces also having a local system to store and manage its security evaporates.. Fill up your data, generate your GST and IGST amounts and you are just one click away from your invoice. Why Purna Invoicing is Useful ? Saves your efforts of calculations of GST and IGST. Generates your invoices with real time data. Stores on cloud to get access anywhere from any mobile devices. Employee need not be at workplace for generating an invoice. Flexibility at work. Save paper wherever you can just save invoice PDF and Send it across. Flexibility of rate as per client requirements, you use less pay less..
You need not pay for multiple users. 1 License multiple users. Purna used 2 way security for software. so your data is well secured. Generate invoice with GST calculations, you are free from calculations. 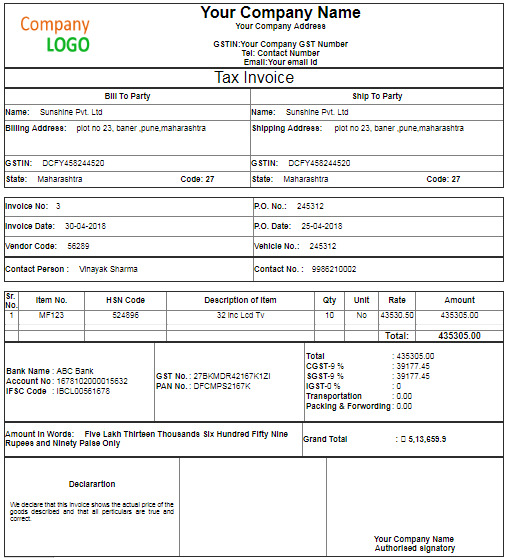 With Purnadata systems you can easily save the invoices as PDF, share it and print it. Even via your mobile. Interesting, right!!! Travelling!!! Not near Computer!!! Don't worry, track your invoices any where. Saves lot of time.